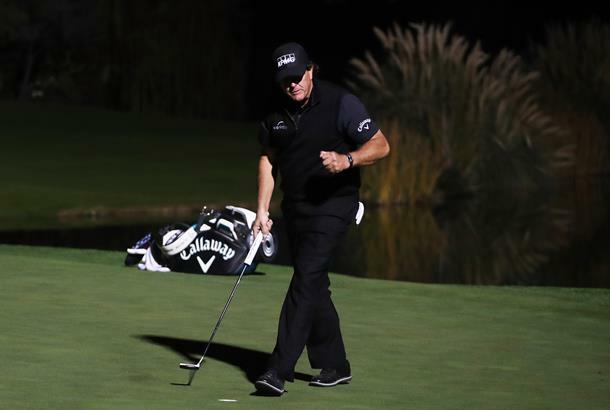 Phil Mickelson hasn't been used to having the upper hand on long-time rival Tiger Woods, but with the help of 22 holes and some floodlights in Las Vegas, he outlasted the 14-time major champion to win $9million and some extreme bragging rights. "Just so you know, I will never let you live that down," Mickelson told Woods afterwards. "It's not the Masters or the US Open, but it is nice to have a little something on you." On the first hole the match looked like Tiger may have the advantage, taking $200,000 from Mickelson after he failed to make a birdie as both men made a par after missing putts from around 10 feet. "That hurts the pocket," Woods had teased. However, he wouldn't win another side-bet for the remainder of the round and it was Mickelson who had the upper-hand for the majority of the time. The first move of the day came from a Woods mistake, lipping a par-putt from a couple of feet on the second that prompted Phil to say 'I've never seen him miss one of those'. He moved to 1UP, which remained until the 7th when he short-sided himself in a bunker and Woods hit his long-range putt to gimmie distance, but would regain the lead on the eighth - in addition to potting $200,000 for winning nearest to the pin. Phil was solid off the tee but struggled on the greens, which was just as well for Woods as the contest may have been a lot more one-sided by the turn. Woods looked to be mounting a comeback after making a birdie at the driveable par-four 11th to move back to all-square, and soon went ahead in the match for the first time on the next with another birdie on the 12th. Yet it wouldn't last long. Mickelson responded by winning his third nearest-the-pin side-bet at the short 13th and holed from seven feet to level, and just two holes later more mistakes on the greens from Tiger handed back the lead to lefty with three holes to play. The most memorable moment of the entire thing came on the 17th: Mickelson had looked in control when he knocked his tee shot to 12 feet and Woods had missed the green, but the 42-year-old chipped in to win the hole as Mickelson's birdie putt failed to drop. Woods then holed a confident five-footer for birdie at the par-five last only to give Mickelson a generous concession, forcing extra holes as the pair returned to the 18th. Both men had chances to win over the next three holes but the contest was finally settled on the 22nd hole as Woods failed to convert a much-better tee shot to eight feet, and Mickelson secured the $9m bonanza with a four-footer for birdie. Woods said: "You couldn't have made this event any better than it was. It was back and forth and very competitive on a golf course that was playing on the tricky side." Branded a 'pillow fight' by the likes of Rickie Fowler, 'The Match' failed to live up to the hyped expectations of a 'unique golfing experience' - although it was hard to pin point just one thing that was missing. The trash-talking was kept at a minimum and was replaced instead by awkward small-talk, the golf was less than stellar and the intentional lack of a crowd meant the whole thing was devoid of a proper atmosphere. And that's before we get in to the commentators talking over players at certain points, and the side-bets that were sporadic and likely should have been prearranged. It also turns out that Bleacher Report, who had billed the match for $19.99, began to offer the stream for free after it had problems with the feed. The UK audience didn't have to worry about that though, as it was offered on Sky Sports Golf for free (if you have a subscription with them). Perhaps it was because it was billed as a spectacle, it struggled to deliver. Most of the famous one-on-one match-ups in golf history have come out of exceptional golf (think the Duel in the Sun or Mickelson and Stenson at the 2016 Open), whereas The Match featured two of the game's greatest missing an extraordinary amount of short putts. Of course, there were absolutely parts that were entertaining and a handful of memorable moments - including Woods' chip-in, but on balance it felt a little flatter than we'd hoped. For us, the concept would have to be much improved if golf were to buy in to the head-to-head battle idea again in the future.